MeetFighters, the world's (by our not entirely arbitrary metric) largest wrestling personals site, has passed 13,000 members]! And we have just turned 8 years old! For those who care, the "active membership", that is, members who have logged in in the past 30 days, is 11693. This means that in terms of active membership, MeetFighters is now bigger than the second and third biggest wrestling sites combined! (And this is on a site that actively discourages practices that would artificially inflate our membership numbers, e.g. prohibiting one person from operating multiple profiles.) We are still a site for the community and run by the community, without a corporate owner or commercial interest. We are sustained by the generosity of our members, and continue growing and giving you new stuff. 82992 photos in profiles, user and group galleries. 44833 confirmed past opponent pairs. All in 8 years of operation! In other news, we have a brand spanking new SSD, partly because it is faster than the old one, and partly because the old one crashed, causing a few hours of downtime a few Fridays back. Thankfully our backups worked well and we only lost a small amount of data and half a percent of monthly uptime. Behind the scenes, we have been busy in the past few months bringing many stability and performance improvements to the site code. Perhaps the most visible change of late was the rearranging of the profile pages. Let me offer some background on the underlying thought process. The mission of this site, as codified in the name itself, is to facilitate meets. Therefore the most important metric with which I measure the site's success is the number of past opponents each member accumulates over time. The quality of meets is also of concern, hence the importance of recommendations. These two key metrics are measured over the time a person has been using the site. So, days, opponents, recommendations. By picking and focusing these three metrics, I am hoping to nudge some members who are reluctant to meet to do it more frequently. To counteract the "wasted" screen space that these boxes use up, other parts of the profile have been broken into two columns, giving quicker access to the introduction and interests of a member. (Granted, "waste" is not the right term for something that is in ultimately infinite supply.) I ask everyone to give the new design some time to grow on you. I am still making revisions to it and your input is valuable, but please understand that it is not possible to come up with a design that appeals to all 13000+ active members. And for those who ask each time and then ignore the answer: yes it is possible to see join/part notifications in the browser chat. Just click on the gears icon on the top right of the screen. I especially want to thank Vanman81 for his blog post and those who commented there. Let me summarize my takeaway from the results. A visually cleaner aesthetic to the page itself. No need to open separate pages to view the details and send a message to the poster. The Meetings feature will be retired in a few months, unless I can come up with some way to make it more compelling. Ideas are welcome. There were a number of votes both for and against the feature. I think there is synergy between this site's core goals and exercise. Martial arts and wrestling are sports after all. For now, implementation of the feature is postponed until a later date. Poll: FitFighters (Workout Journal Feature)? The idea is to let you record and share your workout journal with your friends on MeetFighters, keep track of your progress, etc. I am calling this feature "FitFighters", but that might change the moment I come up with something less corny. Basically the idea would be to let you quickly collect and save a summary of your workout either while you are doing it, or after, in a web and mobile friendly feature. 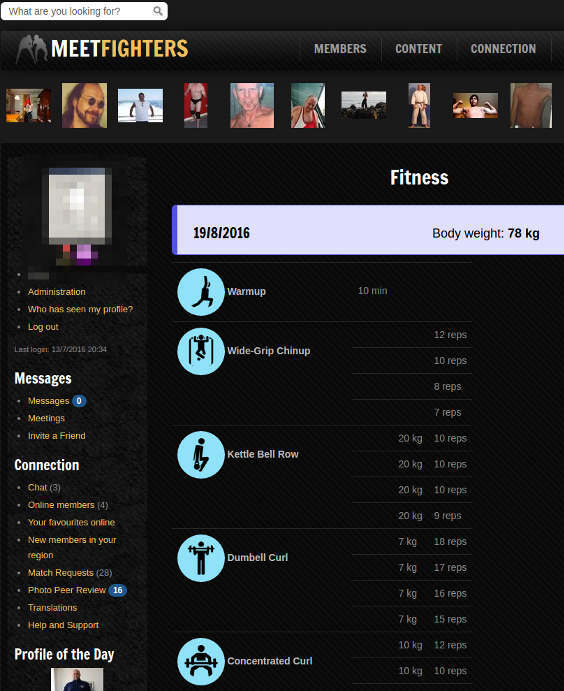 Do you think a Workout Journal feature would be useful? On a related note, I am thinking about killing two existing site features simply because they are not quite as useful as they should be to warrant having them around. Removing useless features will help keep the site interface clean and less confusing for new members. Please don't forget to press the Vote button for each poll individually! Do you think the "Meetings" feature can be removed? The "Meetings" feature is not getting much love. Originally it was intended for the organization of meets that involved more than one person, but it turns out that such meetings are either not happening very frequently or are organized with regular messages. Do you think the "Match Requests" feature can be removed? Similar to Meetings, the "Match request" feature is not getting much use. Perhaps it is time to retire it. Thank you for your participation in the polls! In an ongoing effort to improve the site, I have made some changes to the Browser and Flash chat. The last 10 messages are shown when you join a channel. This is largely an experiment at making the Chat less "noisy" and better for conversations. As always, your feedback is appreciated! First of all, some happy news: MeetFighters.com has reached 12,000 active members! Thanks to everyone who helped make this happen. Huge thanks to the Support team, they answered over 5000 requests for help over the past few years. Also thanks to our translators and everyone who has contributed to making this page what it is today! This address is actually an alias; it will simply forward all e-mail to your regular e-mail address, the one you used when you registered at our site. For now, this new feature is limited to members with 10+ past opponents and donors. Please note that this feature is highly experimental; I await your feedback on how well it is performing for you.